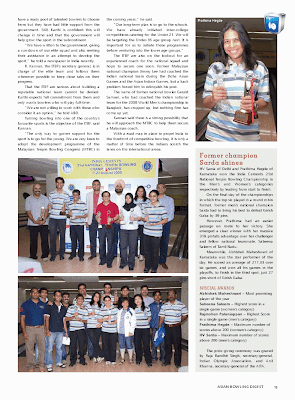 Ulu Klang Recreation Club (UKRC) has certainly stood time and with every year they are growing. 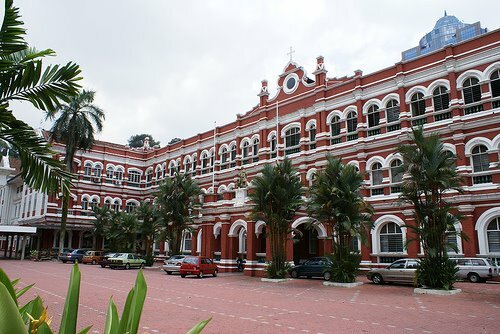 The club is actually 52 years old, but it is not standing like the Spotted Dog (Royal Selangor Club) or like many of the prestigious clubs. 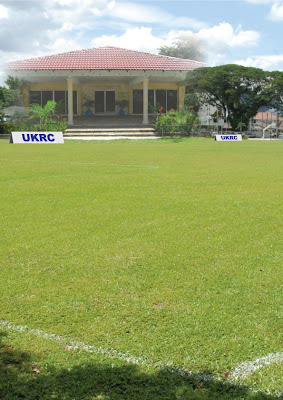 UKRC is a community based club which rests on its humble settings and unpretentious existence. Till today they are still fighting tooth and nail over the title of the land which was bought when they acquired the land on Aug 3rd 1957. It has been a long drawn battle and the latest is that UKRC has been asked to sign a MOU with the local municipality to manage the club. But UKRC led by president Andrew Gopal after having battled for so long for the rightful ownership of the club grounds are not about to throw their towel now. The battle proceeds. However, with the dark clouds looming over the heads, it has not stopped UKRC from continuing with it's activities. 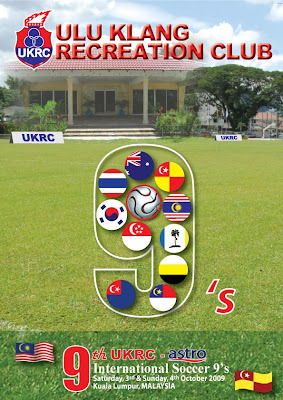 Come Saturday, will see the 9th UKRC-astro International Soccer 9s being held over two days at their club grounds. This afternoon, a press conference was held at UKRC to announce the teams competing and their sponsors. As the title of the tournament reveals, astro are the main sponsors for the fourth consecutive year. And if a giant corporate organisation like astro are prepared to sponsor a small club like UKRC, surely this club must be doing something right. Puan Norzaitol Akmal Ab Halim, the assistant manager Astro SuperSports, who was present at the press conference in her speech said: "This our part of our community service contribution. We are indeed happy with the way UKRC have managed to organise the tournament and how they have built this club with better facilities with each passing year." Indeed, it was sweet music to the ears of Andrew and his club officials, for it only underlined that their sweat and toil to upkeep and built the club to serve the local community, has not gone unnoticed. As usual only a small portion of all the sponsorship money is used to organise the tournament and with the bulk going to their kitty and also further improving their facilities further. The comradeship among the members is exemplary. When Andrew realised that they had bust their budget to organise the tournament (it is learnt about RM10,000 only) and they did not have money for a band for their official dinner on Saturday, he asked the members if they could chip in. No questions were asked and everyone chipped in and soon they have raised RM1,000 for the three piece band - Alphabeat. Nothing has changed over the years. The comradeship has only grown further and even the new members who have joined, have fitted like a glove. UKRC is not just about their soccer tournament. It is a one-stop recreation centre which has a gym, basketball courts, changing rooms, playing field with a pavilion overlooking it,a hall, with activities like yoga, chi-kong, line dancing, table tennis, carom, darts and junior soccer development programme to cater for both young and old. To taste the true hospitality and see the comradeship among the members who take so much pride in their club, be present this Saturday or Sunday. The added bonus will be to see some vintage soccer played by true sportsmen. Never mind that their heart is willing by their legs are not, it will indeed be a fun filled day of classic international football. Twelve teams - Gold Coast Koalas (Australia), Prince of Songkla University (Thailand), Korean Football Team , Singapore Recreation Club, Football Referees Association (Singapore), Thrwhitt Old Boys (Singapore), Penang Sports Club, Taiping Chinese Recreation (Perak), Melodi Jaya FC (Johor), Royal Selangor Club and hosts, UKRC. The champion will receive RM1,000, the challenge trophy replica and 12 medals, the runners-up, RM500, trophy and individual medals, while the losing semifinalist will receive 12 individual medals. The Plate champion and runners-up will also be awarded individual medals. There will be three special awards, namely - top scorer, the K. Suppiah Memorial Trophy (The Best Fair Play team) and the Ong Yu Tiang Memorial Trophy for the Best Goalkeeper of the Tournament. Be there this weekend and witness for yourself what this small community has achieved and capable of. Kudos UKRC. 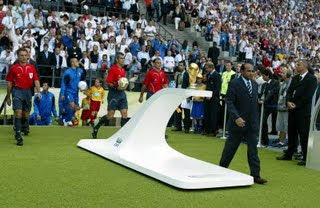 From Selangor trainer in 1992, Windsor leads the two finalists out onto the pitch as the General Coordinator for the Final featuring France and Italy at the World Cup Germany 2006. It is really funny how life turns out to be. I still remember in 1992 when Winsdor John Paul was named as one of the trainers of Selangor, by then team manager Datuk Mazlan Harun. Almost every newspaper asked who Winsdor was? What qualifications he had to be appointed as trainer and where did he come from? amply qualified to be Selangor's Semi-pro League trainer. selected two trainers - Paul and Mohamad Shah Norbit. 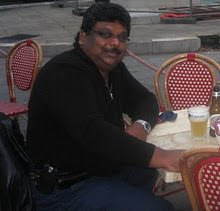 Mazlan has also picked M. Chandran as his assistant. posted to Kuala Lumpur in 1990. The 31-year-old was the FA of Malaysia coaches' instructor last year. Paul wants a chance to prove himself. of and I hope to contribute to Selangor soccer." instructions from Mazlan and Chandran. 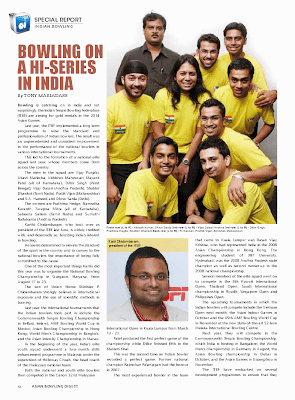 Malaysian Sports and this, Jai Ho, As I see it and Fair Play News. 1. The figure of RM490 million for the HTPC in Brickendonbury quoted freely by all major newspapers and electronic media, besides the leader of the Opposition Party, is an absolutely wrong and highly speculative figure. 2. The RM490 million quoted, has never been and is not our costing for this Project. This has already been affirmed in the Parliament on 10th July (Monday) in a written reply by the Sports Ministry whereby it was stated “ the actual cost for the said training centre has not been established because we are still at the early stages of need analysis and the scope for the development of the centre. 3. This project got off ground with the principal approval of the Cabinet Committee for Sports Development (CCSD) chaired by the DPM and 15 Cabinet Ministers. 4. Further to that, as directed by the Cabinet, the National Sports Council (NSC) was instructed to explore the possibility of co-existence with the current occupants – TARRC. 6. We have to date conducted the feasibility study and now are in the midst of consultation with the Lembaga Getah Malaysia (LGM). In any proposed development project, it is divided into four stages i.e scoping (feasibility study), design, construction and completion/management. Thus, it is clearly underlined that we are only in the first phase. This has been confirmed by the DPM himself in a report from Bangkok today. 7. This only underlines that the huge figure quoted for the development for the project is non-existent. However, on completion of the initial feasibility study, it was reported that it would generally cost 65 million pounds ((RM430 million) to build a full blown sports complex with all facilities available. 8. But clearly that project was not possible because there were the local council of Hertfordshire requirements and restrictions which had to be adhered and that the Sports Ministry would be sharing the site with LGM. Besides, it was never the intention of the Sports Ministry to have a complete sports complex in England, thus went on to dismiss the costing. The Centre is meant to be a hub, forwarding base for our athletes and not a huge sports facility as we have in Bukit Jalil. 9. The rationale behind in wanting to set up this sports hub with the mission to act as an immersion center for selected national athletes and create sports excellence through new training ground and lifestyle strategies. ii) Strategic location, whereby London is seen as the “gate way: to Europe which will enable it to become a “forwarding base” for national athletes. iii) The field of coaching can be developed as there is a larger pool of skilled coaches all over Europe and cost factor will be minimised as opposed to bringing foreign coaches to Malaysia. 11. Currently over the last seven years till last year, an average of RM 2 million per year has been spent by NSC to send athletes from various sports for overseas training stints. This costing does not include competition costs. Thus, it is strongly felt with the setting up of the “sports hub” in England, expenditure for overseas training will drastically reduced, whilst giving more athletes to experience the “overseas stints”. Above all, Malaysian athletes will have a home away from home in the sports hub in England. 12. It has also to be pointed out that long term overseas stint by athletes under foreign expertise has no doubt brought about success at the highest level. Top of our minds are Nicol David, Josiah Ng, Azlan Iskandar, Ong Beng Hee, Sharon Wee, Ng Shu Wai, Noraseela Khalid, Ben Leong. Alex Lim, Kevin Lim to name few. 13. On a current note, the national junior squash team, who were the “pilot” team to use facilities in Hertfordshire, when they competed in Cologne and Amsterdam, have sent back initial raving reports of the facilities and competition that were available around the HPTC, which proved very useful as run-up to the actual competitions. 14. The HPTC, may have received flak from various quarters, but the overall benefits for Malaysian sports to move to a new level and long term benefits, outweigh the criticisms. We hope that above clarification and explanation will change the views of many to support this noble and innovative idea to take Malaysian to the next level. There will be a memorial church service for the late Datuk Brother Lawrence Henry Spitzig at the Cathedral of St John, Bukit Nanas at 6pm (Sunset Mass) on 19th September, 2009 (Saturday). This will be followed by dinner at the concourse of the St John's Institution. updated: pixs at the grave below. 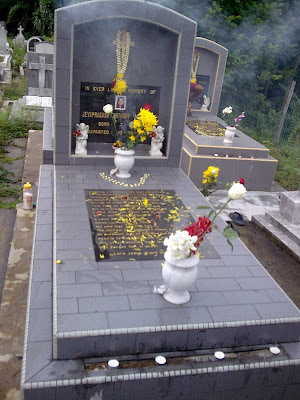 It will be 16 years tomorrow since my brother, Jeyaprakash, passed away after a motorcycle accident on Sept 11, 1993, along 5th mile Jalan Kelang Lama. He would have been 46 years-old on Nov 7 if he was alive. I am the eldest in the family of five and he is the second of four brothers and a sister. Until today, I cannot believe that he is gone. He was too young to have left us and in such a sudden manner. He was a victim of a hit-and-run case. He lay in coma for three days before he passed away. Somehow, I still blame myself for his death because months before he met the accident, my late mother, sister, Jeyaprakash and my youngest brother Jesu, who were all staying with me, moved out to Puchong. Jay Jay as Jeyaprakash was affectionately known among his friends, was working at a lawyer’s firm in the day time and at night was deejaying at a club in the city. He used to finish late normally on the weekends and when he was staying with me at 3rd mile Old Klang road, he would come back as it was close to the city. But since it was a long ride home to Puchong and it was not all the safe to ride home in the wee hours of the morning, he would sleep at his club and return early in the morning. It was on his return home that Sunday morning, when he met in the accident near Overseas Union Garden bus stop. It was rumored that a mini bus hit him, but it was never confirmed. I was at the University Malaya Fifth College playing soccer for the Editorial team in the NSTP Inter-Department Soccer tournament when I received a call from Jesu to inform me of the accident that he was at the Universiti Hospital. Although, Universiti Hospital was just around the corner from where I was, by the time I reached the Emergency Room, he was already transferred to the General Hospital. When I reached the General Hospital, he was in the ICU and in a coma. We all prayed that he would come out of it and be back home soon. But it never happened and on Sept. 13th 1993 in the afternoon, I got a call from the hospital to come immediately, as my brother's condition was serious. I rushed to the hospital with my late father and Jesu, and when I walked into the ICU room, my worst fear came true when I saw his face covered. I still think that if Chinna (that's what the family call him because being second in the family he was known as Chinnanna - small brother) would be alive today if he had still stayed with me as he would have come home after his work. Many have tried to console me that it was fate and it was his time to go, but I still can't bring myself to believe that. This being the fasting month I remember him even more because he used to fast during the whole month because he had many Muslim friends. In addition, my mother would even get up to prepare him sahor and have a meal all prepared for him when he returns home to break fast. There were many times when my sister, Kasthury and mother, would fast with him because they could not stand him fasting alone. Moreover, when Hari Raya came, he would ride off in his bike to his friends house in kampongs and spend a few days with them. 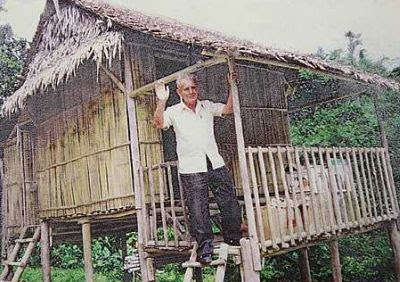 He was a shining example of a true Malaysian! For the record, Jay Jay, is not a Muslim, but my two other brothers, Jesu Adam and Johan Jothi, are both converts. Johan has been working in the Middle East for more that 20 years now. Every year without fail, I would put a memoriam in The New Straits Times in memory of him. However, this year I did not because of financial difficulties since I was laid off work in February. Now that I have started this blog, I decided to pay tribute to Jay Jay here and at least in this blog, I can finally say what has been in my heart all this while. Chinna, was affectionate about football as I am. He used to follow The Malay Mail team for matches wherever possible and was my No 1 supporter as the coach and manager of the team. He was always there to help prepare the drinks, pump the balls and carry the soiled jerseys. He was a confidant to many of my players and sometimes I would hear their occasional woes through him and tried my level best to address them. He was like a member of the team and was there to share one of my proudest moments in the game when Malay Mail defeated the star-studded City Hall team by a solitary goal scored by Daniel Sinnappah to win the KLFA Dunhill Cup in 1998. City Hall SC had the likes of Rashid Hassan, Tang Siew Seng, Razip Ismail, Mat Zan Mat Aris, Saidin Osman, Hashim Marman to name a few. THE VICTORIOUS TEAM.......Jay Jay (standing sixth from the left) with the then known Sharp Malay Mail team who won the KLFA Dunhill Cup beating City Hall FC at the Bandar Tun Razak Stadium in 1998. Squatting fifth from the right is the match winner...Daniel Sinappah. Rocky Bru is on the far right. 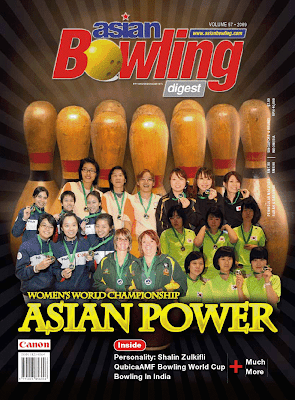 This team had the likes of K. Kannan, See Kim Seng, M. Pavalamani. V. Suresh and S. Tamilarasan, all who had played in the M-League. As brothers, we were close despite the five years difference in age. But like in all families, we have our fair share of arguments too. And he being a Scorpion, was strong headed and there were times where we had screaming battles. But today, I wished all that did not happen and I can go back in time to change all that. I don’t know if Chinna will hear me, but from the bottom of my heart, I want to apologise for all those heated moments. I know it is too late to change things, and I wished I could have done more for him and that he was still around for me to have those arguments all out of love all over again. However, it is impossible for now. I hope to meet you one day and personally apologise and make up for all the lost time. I miss him very much and so does my sister and brothers. My parents have joined him and we are left here all alone. We will be visiting his grave in Meru, Klang tomorrow morning to pay respect. My parents graves are next to his and it will indeed be a touching moment. 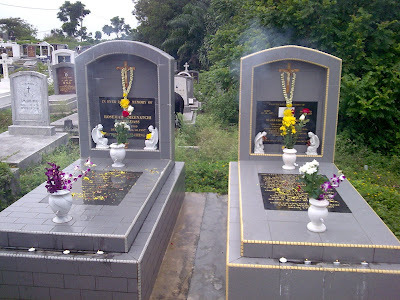 Chinna's grave and on the background where my parents were laid to rest. To his friends and relatives, whom he might have touched in one way or other, please remember him in your prayers. Lord grant Jeyaprakash eternal rest and let perpetual light shine upon him. May he rest in peace and God Bless him forever! The idea and the birth of the Professional Footballer's Association of Malaysia (PFA Malaysia) which was officially launched on Thursday, all sounds good. Somehow, I am sceptical about the whole setup. Yes, it is only a protem committee and new committee will be elected soon. It was a very impressive and professional launch at a hotel in, but the composition of the people present did not authenticate the event. Missing in numbers were the professional soccer players themselves, except for seven National U-23 who were regarded as the pioneer members of the association. Also not present were the icons of Malaysian footballers, except for Bakri Ibni and Zainal Abidin Hassan, the coaches, and the officials from the State FAs. Yes, the FA of Malaysia secretary-general, Datuk Azzuddin Ahmad was present and Deputy Sports Commissioner, Mohd Salleh Ramli officially endorsed the PFA and was the VIP for the event. But something did not gel in the event. ONE FOR THE PFA MALAYSIA ALBUM......(standing from left) Subramaniam, Chelliah, Mohd Salleh, Azzuddin and the seven pioneer members from the National Under-23 squad. 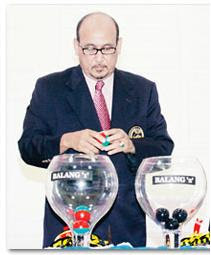 PFA Malaysia general secretary, E.R. Subramaniam was holding court from start to finish, that protem chairman, Dhinesh Chelliah, was totally overshadowed. Speaking of Chelliah or popularly known as dc, as is his array of printing companies which all start with initials dc, he seemed lost in the event. The organisers for the event were from dc companies, which left many wondering what a printing company was doing in a professional footballers’ association setup. Call cards distributed by the organisers at the event, all bore the name of the company dc instead of the newly established PFA Malaysia cards! If they are in the process of printing the cards, one wonders how come all the folders, programme cards, brochures in the bags, notepad, and T-shirts were all ready for the event. But it was learnt that dc are the main financial backer and involved from the beginning in the set up of PFA Malaysia. Little wonder that the folders, programme cards, brochures, the bags and notepads, were all impressive and of high quality. Then the tagline for PFA Malaysia caught the eyes of many – For the Sake of the Game. (Should it not be For the Sake of the Players). One quick look at their taglline and one would have mistaken it For The Sale of the Game! Do not be mistaken though that the objectives and the benefits for the players are all noble. Assuming that PFA Malaysia will be working hand in hand with the FA of Malaysia, I would have thought that the former would have struck an agreement with the national body to ensure that all the professional players who sign up with FAM to be automatically registered with PFA. This way, they can fulfill their objective to be the voice of professional players in the country and to act as the collective bargaining agent. This will similar like all the unions for the various professions. However, membership to PFA is voluntary. This would mean that players who are not registered with the PFA will not see their welfare being looked into. What about several professional players who have recently left the scene frustrated of non-payment from the State FAs. 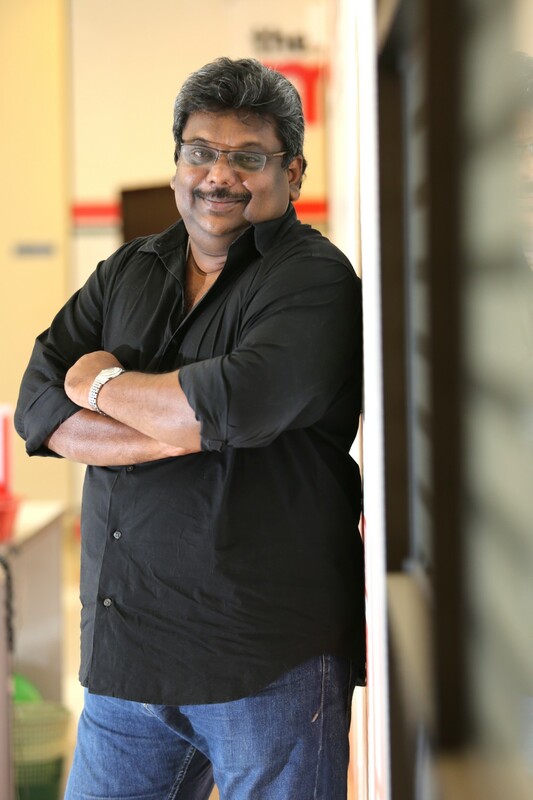 Subramaniam said that they will only look into welfare or plights of players who are currently professionals. As a new entity in Malaysian football, one would have thought that they would have started off by helping some of the professional players who had to leave the game because of non-payment of salaries to become drivers and security guards. This would have been seen as a noble gesture and would have been a selling point for the new establishment. But now, these former players probably will have to register themselves as Associate members, if they are allowed, before any form of help can be rendered. Lastly, something tells me that the presence of a private company in the setup is a business venture to reap from merchandising, branding and commercial deals for players. It is fine to have the experts working from the outside as consultants with PFA for the above, but to have them being part and parcel of the setup, certainly looks like conflict of interest. 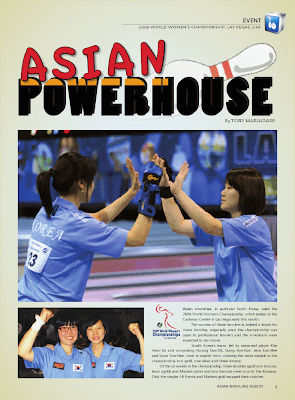 It is hoped that the setting up of PFA under the present scenario does not lead to more disputes. If that happens, who is going to resolve these issues? It is learnt that a seminar in collaboration with the FA of Malaysia a seminar will be held for players, officials and coaches of the M-league. It is hoped that a clearer picture is painted in the seminar and any doubts are cleared once and for all. For now, congratulations to PFA Malaysia for having made the move to set up the organisation, but hopefully was kicked off on the right note. The last thing we need in our soccer scene is another controversy! It's good to hear FA of Malaysia deputy president, Datuk Redzuan Sheikh Ahmad change his tune towards the target of the Laos Sea Games in December. Wise move Redzuan and no shame in going back on your bold gold medal prediction. It is without doubt that the National Under-23 team coached by K. Rajagobal, is coming under tremendous pressure after a string of creditable performances against formidable teams. Rajagobal's team have so far defeated visiting Zimbabwe represented by Monomotapa United (classified as A-International match) 4-0 and 1-0, lost to Manchester United 2-3, 0-2, played to a scoreless draw against visiting China and Kenya, before travelling to Middle East where they lost 1-2 to Saudi Arabia, 0-1 to professional outfit Al-Qadisiya and held Jordan to a scoreless draw on Sunday. Already newspaper headings like "Malaysia lose again" and "Another draw", indicate the mounting pressure that is already on the shoulders of this team. It certainly does not help to get added pressure from the FA of Malaysia. However, at the same time, I am not saying that there should not be targets. There should be targets, but REALISTIC targets. Redzuan's current stand to only set the target after the Laos Sea Games soccer draw only makes sense because if by the luck of draw, Malaysia gets drawn into a "Death Group" of top teams in the region, it is going to be tough to make the semifinals. Let us not forget that Thailand, Singapore, Indonesia and Myanmar are ranked above Malaysia in Asia and teams like Vietnam and even Laos have defeated Malaysia. Yes, the current Under-23 team is showing good signs of a fromidable team, but they cannot become champions over time but only through time. A modest target for the Sea Games would be to reach the semifinals and then take it from there. Let us also be reminded that the last time Malaysia won the Sea Games was at the Kuala Lumpur Games in 1989 under English coach Trevor Hartley. While we cannot dream to be champions overnight, we also cannot continue to give the excuse that it has been 20 years since we won the title and thus it is going to be difficult. 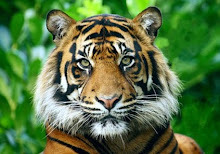 Probably, this is a good chance for Malaysia to make the final, but let us not get our hopes high. Rajagobal needs to be given some time to whip this team into shape. We still lack in several areas and one glaring area is our strike force. And we cannot turn out strikeforce into scoring machines overnight either. Another factor, Rajagobal should pay attention is to injuries to players. If it is injuries suffered in the course of game like a fractured leg, ankle or hand, it is part and parcel of the game. However, if it is muscular injuries, then Rajagobal has to look at the condition of the players. Many of the players when they return to their respective States do not take care of themselves with proper nutritions and strengthening their muscles. And when they report for national training, they come back not fully fit and when put through their tough regiment of national training, they breakdown. Rajagobal is an experienced coach who adheres to sports science and keeps tabs of his players even they are not with him. He should be able to minimise this problem, but at the end of the day, it still boils down to the individual players as professionals to look after themselves. Rajagobal is indeed on the right track with his team and it is hoped that there are no interuptions to his plannings and the best support is given to him. Playing against higher ranked teams, is certainly the best thing that could have happened to his team. It is hoped that it is continued until the Sea Games and let us all hope that the team will give us something to shout about. Afterall it has been a long time since Malaysian soccer fans have tasted success - even if it is at the lowest level - the Sea Games. Even an appearance in the final, will be something to shout about. But whatever happens, this team must be given the full support and time to blossom into its true potential. FORWARDS: Ahmad Fakri Saarani (Perl is), Zaquan Adha Abdul Razak (N.Sembilan), Norshahrul Idlan Talaha (MyTeam), Ahmad Shakir Md Ali (Harimau Muda), Farderin Kadir (Kuala Muda).